Sound "Played normally with the PMD100 filter, the Eclipse is a decent-sounding CD player," but "the player in its 24/96 mode has a much more dynamic, incisive and inviting sound"; "has a forceful sound that is awe-inspiring with music that itself has a grand sense of scale." Features 24/96 DACs in a fully balanced circuit, 24/96 digital filter too; XLR and RCA outputs; BNC digital output and input; isolated transport mechanism; very sturdy build. Use In almost all cases, the Eclipse sounds its best via its 24/96 digital filter -- with the digital output going right back into the player. Value "Highly recommended for those with hefty wallets in search of the finest in CD sound." My experiences with the Simaudio Moon Eclipse CD player began quite some time back -- almost a year ago, in fact. Between then and now, I've received many (many!) inquisitive e-mails as to exactly why it has taken so long to finish the review. Well, truth is not always stranger than fiction. In this case, its rather boring. Simaudio called and asked if they could get the player back for a short time. It seemed that they ran short and needed it pronto for a demonstration elsewhere. It would be back quickly, I was assured. "No problem," I said, and packed up the player for its supposed short trip back to Montreal and then back to me. But the few weeks turned into many months. The player, it seems, went out, and then was transferred yet again; and then I had problems accommodating the player -- with all the review equipment I get in, I couldn't fit the Eclipse back in until now. Still, in hindsight, this little ordeal turned out for the better because I've had more experience with the player -- and have much more insight to offer. The Simaudio Moon Eclipse is one of the heartiest CD players on the planet. Pick it up and you realize that this massive and exceptionally dead-feeling player means business. Its weighty body hunches forth on four heavy-duty spiked feet. It looks to be almost clutching the shelf. But the Eclipse is the result of a cost-no-object approach. When Simaudio embarked on the design for their first CD player, they purposely set out to challenge the state of the art. As a result, everything about the Eclipses appearance and build breathes high-end quality: robust chassis construction; flawless finish, and technically inspired design. 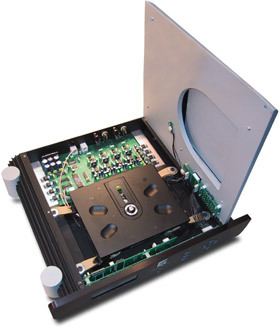 The Eclipse is a two-piece system with a separate dedicated power supply. The main unit loads from the top, something that mandates it be placed on the top shelf of an equipment rack. Sometimes designs like this are a bit of a hassle ergonomically, but unlike many companies that simply put the sliding drawer on top, Simaudio has taken advantage of this design approach and placed key operational buttons on top too. This may not seem to be a significant feature, but once you play with a top loader, you realize that it really does make sense to have the most-used buttons on top. For inside the player, the company chose the Philips CDM12 Pro for the transport mechanism and suspended it internally with a nifty "double action" suspension system that isolates in vertical and horizontal planes. This is one of the nicest systems Ive seen for isolating the transport, but you have to be careful not to shake the player around too much once you remove its transport screws (and NEVER ship it without replacing the screws because it will get damaged). As with most top loaders, you need to place a little puck on the disc after youve laid the disc onto the transport's spindle. DONT forget to do this or your CD will spin wildly inside when the mechanism fires up (and likely scratch the disc up a bit). For digital-to-analog conversion, Simaudio uses four matched Burr-Brown PCM1704K DACs in a fully balanced implementation. These are capable of 24-bit resolution at sampling rates up to 96kHz. For digital filtering, the company has taken a unique path. By default, the player uses the Pacific Microsonics PMD100 HDCD digital filter. However, the company has also implemented a digital filter (again by Burr-Brown) capable of accepting signals up to 24 bits and 96kHz. This filter is accessible through a BNC connector located on the back panel, so you can hook up an external DVD drive. Theres more though. Simaudio also put another BNC connector on the back, which takes the signal directly from the drive inside -- a digital output. With a BNC-terminated digital cable, you can simply connect the output BNC to the input BNC and presto -- with a flick of the 24/96 switch on the front panel you can change from the PMD100 to the 24/96 filter on the fly! The advantage of doing this Ill expand on below. Also on the back panel is one set each of single-ended RCA and balanced XLR jacks. Simaudio says the Eclipse sounds best used via the balanced outputs because of its fully balanced circuitry, but my system is all single ended, so that wasnt an option for me to try. On the front are the remaining buttons that are not on the top of the chassis and also the LED display. Main power to the unit is turned on at the external power supply, which is to be left on all the time. A Standby switch on the front panel is for day-to-day powering on. Its important not to turn off the main power switch unless you have to (such as for vacations and the like). I found the Eclipse to sound best once it has been warmed up for a day or two. Dont judge it cold out of the box. Rounding out this feature-rich, ruggedly built player is the equally heavy, all-aluminum remote control. This is the same unit that ships with P-5 preamp, and one remote can be used to control all the units (and for self defense should an intruder enter your house). The price of the Eclipse is $4995 USD, and it has a three-year warranty on the transport mechanism and a substantial ten years on the electronics. Given my two review sessions with the Eclipse, I was able to use the player with more equipment than Ive had the opportunity to with any other review piece. Amplifiers included my Blue Circle BC2 monoblocks and the companys new BC8s, the Wyetech Labs Topaz, as well as Redgums RGi120. The preamplifier was always my trusty Blue Circle BC3000, while speakers were wide ranging, including the Cliffhanger CHS-2/W-2, Verity Audio Fidelio, Axiom Audio Millennia 40Ti, JMlab Chorus 705, and Mirage OM-7. Cabling came from Nirvana Audio, Magnan, Nordost, Silverline, and JPS Labs. All auditioning was done in my extraordinarily congested, but optimally tuned listening room that includes ASC Tube Traps, RoomTunes, and personally created diffusers and absorption panels. With the superb, built-in spikes on the Eclipse, no kind of tweaking was necessary, except I did manage to sneak in the Assemblage D2D-1 upsampler/jitter-reducing box -- yes, I used it with a one-box CD player! Read on to find out how. Two CD players in one! No critique of the Eclipse can be done using it only through its standard PMD100 digital filter. The Eclipse is really two very different-sounding players in one. Hook the BNC jumper cable to the back like I did and youll receive an ear-opening lesson in the difference a digital filter can make. (You can also do one better and hook the upsampling Assemblage D2D-1 in the path -- its not nearly as startlingly a difference as moving to the 24/96 filter, but it offers yet another small bit of refinement to the overall clarity of the sound, particularly in the upper registers and the rendition of soundstage depth). As a result, my review of the player will touch on both aspects of operation, but will focus more on using the Eclipse in the 24/96 mode. As youll learn quickly here, the player sounded much better in almost every way in the 24/96 mode. Only in rare cases, which Ill mention, do I think anyone should use it in its default mode. I didn't find that the Eclipse needed any type of substantial break-in, but like I said, it does need a substantial warm-up period. Lionel Goodfield, Simaudios rep, told me "turn it on and just leave it on." So I did. Out of the box, turned on and revved up, the player sounds a tad analytical and cold. Once its had its circuits cooking for a bit, things settle down and get a little more palatable. Played normally with the PMD100 filter, the Eclipse is a decent-sounding CD player with good bass weight, nice high-end extension, and overall good clarity. Voices have a fairly warm and inviting sound, guitars ample texture and presence, and drums and other percussive instruments strong and well-defined presence. Its the type of sound thats complete, but deep inside you just know that something more should be brewing for a player that costs this much. Quite simply, at this price point, the top-dog CD players all have something special -- really special. But with everything connected properly, pushing the 24/96 button changes the character of the sound substantially (actually, pushing the button will get you more of a pronounced change than you may think -- the volume is higher, so you must level match to compare). Played at the same volume, the player in its 24/96 mode has a much more dynamic, incisive and inviting sound. When played with speakers that can really whomp home the bass, such as Cliffhangers CHS-2/W-2 combination or the Mirage OM-7, my system sounded like I had added a subwoofer. I remember playing Jewels Spirit [Atlantic CD 82950], a recording that has an up-front and weighty sound. Changing the mode for the first time dropped my jaw to the floor with the newfound bass foundation -- and that was with the 18Wpc Wyetech Labs Topaz amp! Even with so-so recordings, like Didos "Thank You" from No Angel [Arista 07822-19025-2], the differences are a snap to hear. Dido's voice is more distinct and detailed and much easier to discern in the mix. The drums are tighter and more forceful, and the soundstage takes on an increased sense of dimensionality. In 24/96 mode, the Eclipse's bass depth and weight, as well as definition through the entire frequency range, take a marked leap forward. The Eclipse simply springs to life. well, almost. Like I said, the 24/96 improves on the PMD100 HDCD filter in almost every way -- including with HDCD-encoded discs. Where I did prefer the HDCD filter, mind you, was on extremely poorly recorded material (usually pop) with very aggressive treble or plenty of midrange grain. Playing the Eclipse through the HDCD filter has a distinctly more subdued sound, which can tame the nasties from bad-sounding discs. Its a more palatable and likely colored sound. With the vast majority of my music, I did not feel the need for any taming down. Daniel Lanoiss thick and atmospheric production really shows itself well on "One" from U2s Achtung Baby [Island 510490]. While Ive heard this track rendered nicely before, I hadnt heard it as well dissected in its presentation as here. Heard through the Mirage OM-7s, Bonos vocals leapt from the mix with a sense of specificity and space that I havent heard from this recording before. Larry Mullens drumming is delivered in an ultra-tight and tightly focused way, which lays a rock-solid foundation. The wholly artificial soundstage takes on vibrancy with outstanding delineation of the instruments. As I stated, the Eclipses strong point in its 24/96 mode is an incisive, visceral and highly defined sound. Telarcs recording of Carmina Burana with Robert Shaw and the Atlanta Symphony Orchestra and Chorus is well known to most audiophiles [Telarc CD-80056]. Re-acquainting myself with this recording through this player was a wholly rewarding experience. The Eclipse is able to unravel a soundstage, displaying great width and depth with excellent delineation of the voices -- the best Ive heard. And the large-scale dynamics for which Telarc recordings are known are rendered here with an awesome sense of weight and control. The Eclipse slices through every nuance in this recording and presents it all in great relief. The same can be heard from the interesting Spanish/Western-flavored soundtrack to the movie All the Pretty Horses [Sony Classical SK 89465]. For the most part, this is an intimate recording relying on acoustic instruments in sparse arrangements. However, there are a number of tracks, most notably the two versions of "Cowboys Dream," that are there to give certain scenes in the movie a much grander sense of scale. Theyre weighty, authoritative cuts that energize a room. Played through the Eclipse, they sound markedly stronger, and the music breathes of almost limitless power. Similarly, overblown pop recordings such as Toni Braxtons "Un-break My Heart" (Secrets [LaFace 26020]) come across with a nerve-tingling presence. The type presentation Im talking about here is akin to going from an amplifier that can barely power your speakers to one that is two or three times what you really need. You may not be playing it any louder, but you gain a sense of effortless control -- thats what the Eclipse does best. In fact, it makes the majority of CD players sound lethargic. Given the length of time between my first and second runs with the Eclipse, I had a chance to compare it to Audio Aeros $4200 Capitole CD player and their newer $6200 Capitole 24/192. These three players are all excellent, but distinctly different. The regular Capitole is a wonderfully smooth and liquid player. Its robust and warm sound will be welcome to those who enjoy a rich and full-bodied presentation. Its downfall, though, is in its ability to deliver really deep and tight bass. As well, it just doesnt have the same resolution of either the Eclipse or its 24/192 counterpart. The Capitole 24/192 is the more logical comparison to the Eclipse, and it costs over $1000 more. The Eclipse is the more visceral and impactful of the two. Although the Capitole 24/192 is a clear step up in the whomp and wham department over the standard Capitole, it still doesnt quite have the weight and authority of the Simaudio Eclipse. In terms of other attributes, though, it gets more difficult to compare. The Capitole 24/192 is as smooth and sultry as the finest analog system. Its not as tubey-sounding as its little brother, but it is every bit as silky. It is simply a joy to listen to and can deliver expansive, extraordinarily detailed and gorgeous sound. At high and low volumes, it sounds superb and can do justice to any type of music. The Eclipse, on the other hand, is more up-front -- its clean, fast, and incisive. It doesnt have the sultry, smooth and seductive sound of the Capitole 24/192, but it has its own sheen and clarity that will appeal to those who value dynamics and exciting contrasts. In the end, which is better will depend not only on tastes and preferences, but also on the type of equipment matched with either player. Both of these players achieve top-notch sound, and they are likely the state of the art in terms of CD playback, but they do it in somewhat different ways. I suspect that most consumers will choose one over the other, the differences being that pronounced. The Simaudio Moon Eclipse is one of the best-constructed CD players available. The fit, finish and detail are superb, and operation is flawless. Its obvious that great care went into its design. This is a true high-end piece -- not a flimsy appliance. I wish all equipment at this price would be built this way. The ten-year warranty on the electronics of this player (three years on the transport) reflect Simaudios confidence in the way its built. In terms of its sound, had Simaudio only shipped the Eclipse with the standard HDCD filter, the player would get a limited recommendation. In that mode, it has a sound thats hard to criticize, but theres nothing that leaps out at you as really special -- at its price anyway. But played in its 24/96 mode, it gets better -- much better. That incisive, visceral, and exciting presentation it possesses is one that few players, if any, can match. If you audition the Simaudio Eclipse, insist on hearing it this way -- I know youll be impressed. And if you own the player and havent tried its 24/96 filter, youre really missing something. In the end, the Simaudio Moon Eclipse is highly recommended for those with hefty wallets in search of the finest in CD sound. Warranty: Three years for transport mechanism, ten years for electronics.